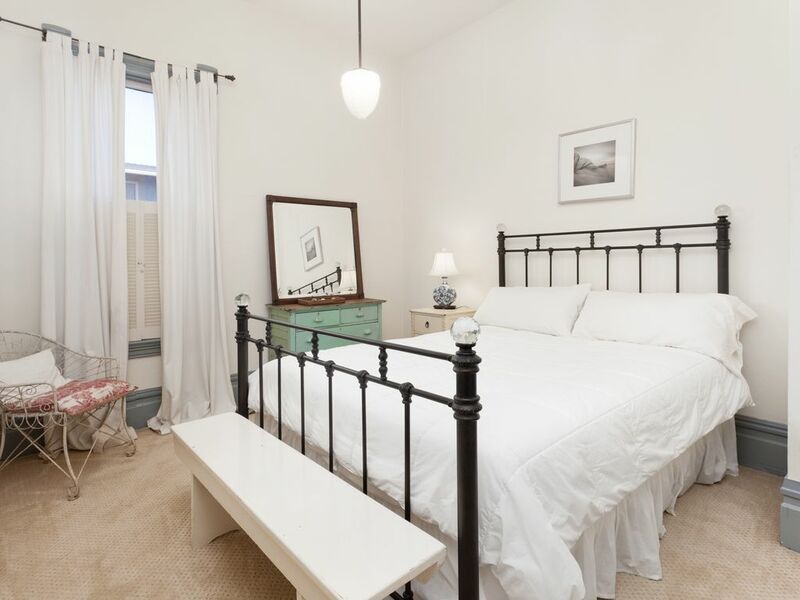 Charming, sunny, one bedroom vintage cottage apartment on the Island of Alameda, just five minutes from a wide, sandy beach and a short ferry ride to San Francisco. Enjoy the ambiance of this lovely California beach town, with cafes, bookstores, resplendent Victorian homes, tree-lined streets, manicured parks, a historical business district, and a temperate climate. Located just 3 miles from the Marina Village Campus, the Wind River Campus and 2 miles from the Alameda Maritime Institute. Arrive to a bottle of wine from my private wine collection to help you settle into the moment. Be inspired by the lovely old character of the building, the large airy sunny rooms, and the private cottage garden tucked away in a private setting. Enjoy one of a kind vintage pieces hand picked by the owner purchased from local flea markets and specialty shops in the Bay Area. Take a trip to Alameda Point and visit Alameda's Booze Alley (Rockwall Winery, Building 43 Winery, Faction Brewery, St. George's Spirits, and Hanger 1 Vodka). Or spend an afternoon in our Historic Park Street District shopping and dining. Take in a movie at our newly restored Historic Theater, or enjoy a day of golf on our 45 hole golf course at Harbor Bay. Ferry across the bay to explore San Francisco's Fisherman's Wharf, Pier 39, North Beach, the Ferry Building, or Alcatraz. Ride on a cable car and enjoy a day of glamorous shopping at S.F. Union Square. Neptune Beach rentals come fully equipped with urban farm house style furnishings, fine dishware, cutlery, linens, a full gas range, cable television, a DVD player, and wifi internet access. Choose Neptune Beach Rentals for your short term, business stay or long term stay experiencing all that the San Francisco Bay Area has to offer. Overall the place and owner were great. She left a bottle of very good wine upon check-in. The place and area were nice, I had never been to or stayed in Alameda. I gave this a four star review because the cottage is right next door to another cottage or apartment. The people in this place had at least a couple of kids and they were actually pretty noisy until about 10PM most nights. I think I thought it was going to be a stand alone cottage but its not so know that going in.It was still a nice place, and Karen was great. I really enjoyed this little jewel! Great space in a convenient location. I stayed here while attending a conference in the city. It was a very relaxing retreat away from the hustle and bustle of the city. The host really made it extra special by leaving nice soaps, bagels, cream cheese and orange juice. I look forward to staying here again in the future! Thanks Shannon for a wonderful review. So appreciative of all your kind words! It was a pleasure hosting you during your conference, and I'm happy to hear that the location away from the hustle and bustle of the city worked for you. We were greeted with a welcoming bottle of wine, bagels and cream cheese as well as chilled water bottles and a cupboard full of tea and coffee! Wi-Fi is easy to access if you have a bit of work to address. Comfy bed and great kitchen for cooking your own meals. Pull out couch worked great for my son. Uber drivers abound and very safe neighborhood- we walked to a corner store. We recommend the seafood restaurant in Karen’s binder. You can head in any direction from Alameda. We found it convenient to go to the redwoods in the north or travel south to Half Moon Bay. Of course San Fran, Tiberon and Saucilito are right across the Bay. We plan on coming back already and will definitely check our dates out with Karen. I see why she has many repeat visitors! Thank you Ann for such a wonderful review! I so enjoyed reading the text messages that you sent me sharing your experience of some of our most popular tourist destinations. So glad you enjoyed your stay! And, thanks for taking such good care of the space, I hope to see you back soon! My daughter and I stayed at this lovely cottage for a few days in July. The location was ideal. The cottage itself was immaculate and super comfortable. It was very spacious but cozy at the same time. Our host, had bagels and cream cheese , juice and coffee cream in the fridge for us. Lots of coffee choices in the cupboard. The kitchen was cooking ready! We really appreciated this thoughtful touch. We loved staying here . It's super close to the ferry landing where we could catch the ferry to the San Francisco during our stay. We hope to return to this great little cottage soon. Thank you Karen for being an awesome host. We appreciated everything! Thanks Susan for such a lovely review. I really enjoyed hosting you and your daughter! It's guests like you that make hosting a rich and rewarding experience. Hope to see you back soon -- you're welcome anytime! It was close enough to the city that it was really convenient to go back and forth but it didn't have all of the commotion and noise of a city, which was great. Its a really cute town with its fair share of good restaurants. Thanks Alexandra for taking the time to write a review. Glad you loved it. Alameda is a cute town -- I discovered it several years ago and decided to make it my home. You're welcome back any time! The two things I would comment on that others have mentioned are, the front step is a bit steep (it's a bit of a balancing act to lock the door when you leave) and the clawfoot tub is a bit awkward to shower in with the surround shower curtain thing pressing against you. Another tip is that some of the local restaurants are not open on Monday or Tuesday night. So if you're planning to go somewhere, check ahead to make sure they're open. The quality toiletries that came with the cottage were much appreciated. I hope to return some day. Located 5 minutes from the Alameda Main Street Ferry Terminal, 5 minutes from Alameda Point, and 5 minutes from Crown Memorial State Beach. Rates are based on 2 guests; add $25 per night, per additional guest. Holidays rates are $189.00 per night.